COMMELL’s Half-size ISA platform HS-870S based on Intel 82855GME and 82801DB Chipset, which offers a highly integrated low power, high performance chipset solution that has been optimized to support the Intel® Pentium® M processor running up to 2 GHz and Celeron M processor running at 1.5G+ Hz. Meanwhile, the Low voltage and Ultra Low voltage version supports on HS-870S. The low voltage and Ultra Low voltage version allows you operate the system in the most tough environment. The HS-870S supports high speed DDR333 in addition to DDR266/200 memory providing maximum capacity 1GB, integrated graphics controller with Intel Extreme Graphics 2 dual independent displays , The integrated display controller comes with up to 64 MB of dynamic video memory allocation and Single- or Dual-channel LVDS panel support up to UXGA resolution. The HS-870S comes with floppy, PS/2 Keyboard and Mouse, 2 x RS232C, 1 x Printer port, UltraATA 100 EIDE and IrDA interface on-board, Networking is provided by Intel 82541PI Gigabit Ethernet LAN. 2 x USB2.0 ports for 40X faster data transfer rate and backward compatible to support USB 1.0 devices and AC97 3D Audio are also integrated. Additionally, HS-870P is also equipped with CompactFalsh Interface for easily using any memory card. 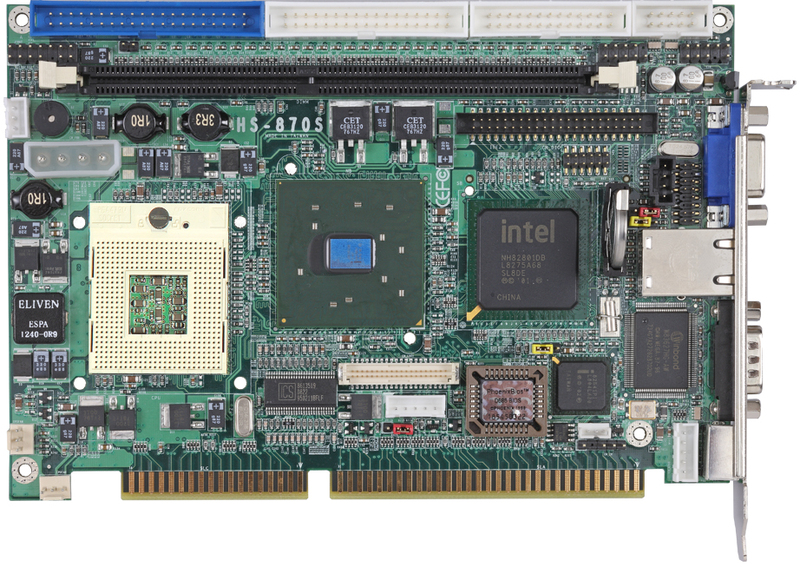 The COMMELL HS-870S is designed to meet the needs of applications that require extraordinary computing performance, reliability and other tough environment with low power consumption processor, which also well supports with the Windows 2000/XP, Linux operation systems. CPU: Intel Pentium M & Celeron M @ FSB 400MHz. Memory: 1 x 184 pin DDR DIMMs support up to 1.0GB DDR333 SDRAM. ECC supported. Chipset: Intel® 8255GME and 82801DB. 1x184 pin DDR DIMMs to support up to 1.0GB DDR266/333 SDRAM Supports unbuffered ECC memory.